I was asked by the European Association for International Education (EAIE) to develop the first of their Pathways to Practice e-guides. This new series of practical guides is designed to be a 'practitioner's toolkit'. 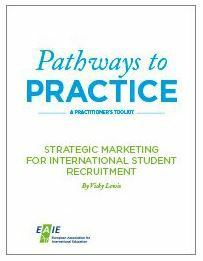 To help practitioners to argue the case for a strategic marketing-based approach to international student recruitment. To guide them through the process of creating a robust international marketing and student recruitment plan. Any successful student recruitment plan is built on strategic marketing and long-term relationship building. Resources need to be focused on the most productive activities. This guide seeks to provide a useful framework to keep your planning on track.